In 2008, Colombian politician Ingrid Betancourt made headlines when she and fourteen other hostages were rescued after being held by a guerrilla army in the Colombian jungle for over six years. Betancourt detailed her account of those events previously in her 2010 memoir Even Silence Has An End. But in her debut novel of the fictional persuasion she has undertaken the task of telling the story of Argentina's "Dirty War" - a period left out of most classroom history lessons - through the lens of her experience. Penguin Press | 2016 | 368 pp. This "war," which Argentinians call the time of "state terrorism genocide" is a blight in the nation's history. Covering the early 1970s through the early 80s, it was a period of uncertainty and terrible truths in the wake of Peron's return from exile, and the subsequent succession of his widow Isabel to the presidency following Peron's death. Marxists and socialists - many of them students - were hunted down and tortured; members of their support networks were assassinated in the streets. And between 10- and 30,000 citizens became "desaparecidos" - the disappeared. Some of them - their bodies would wash ashore in Uruguay after being thrown from a plane. Some of them were tortured and then disposed of into mass graves, and wait even now to be identified. Still others will never be found. 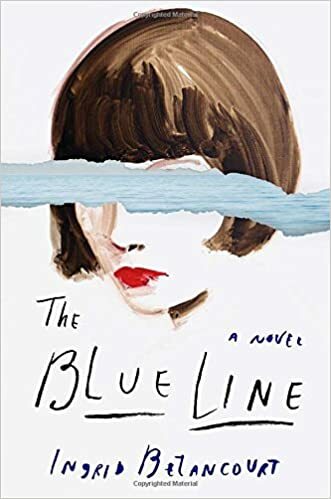 In The Blue Line Betancourt merges her own experiences with this history, and creates a character - Julia - who embodies her own personal strength, but who also carries a secret that allows her (and the reader) to foresee the horrible suffering to come as the story unfolds. Julia has inherited her grandmother's gift - visions of the future through the eyes of an unknown source who calls, in one way or another, for help in their future moment. As a child, Julia saves her sister from drowning by teaching her to swim before the disaster she has foreseen can occur. As an adult, she has to confront a vision of her own future - which Mama Fina describes - in order to save another life, only to find herself being broken many more times by the death squadron that ruled Buenos Aires. The magical aspect of the story takes a backseat to the horrors of the reality that Julia lives, but her character is stronger for it. What might in another novel be a distraction proves, in this one, to be a comfort - a way by which the reader can prepare themselves for each next step of Julia's perpetually angst-and-anxiety-ridden life. The story, if a shade unbelievable, is harrowing in its brutal descriptions of the horrors of a very real history. Julia, Mama Fina and Theo may not be as factual as that history, but Betancourt brings them to life with a deft vibrancy - an effect, I believe, of an empathy that most of us will thankfully never understand.